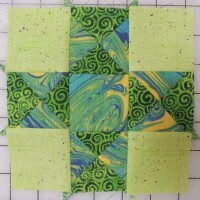 In February, we are making a big 14-inch square (finished size) Star Chain block using your choice of 2 or 3-color combinations including green. This is one of mine. You can make a maximum of FOUR blocks for chances in the drawing at the end of the month. As always, if you like, you can make more and donate them to the pot. You will likely be asked to mail individual blocks to winners. GREEN background fabrics may be solids, tone-on-tone prints or multicolor prints that are predominately green. 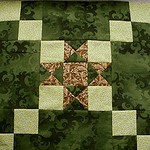 Medium to dark greens will provide the best contrast with the LIGHT fabric. LIGHT chain fabric may be any light-colored fabric except white. It might be pastel or a low-volume print in any color you’d like to combine with green. Prints with white background are OK. The LIGHT fabric may be LIGHT GREEN. 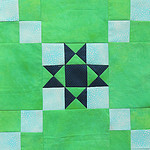 CONTRAST star fabric may be any fabric which contrasts with both the green background and light chain fabric. Because it is used in small pieces, solids, tone-on-tones and small prints will work well here. 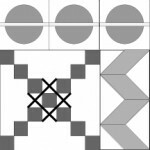 If you make multiple blocks, you may use the same fabrics in multiple blocks as long as each block is made from a unique 3 fabric combination. 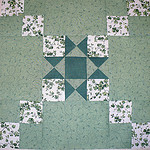 My suggestion is that you cut and sew the star center unit first as a way to see immediately if all three of your fabrics play together and have enough contrast. 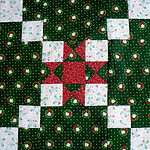 Note that this differs from a traditional Ohio Star block in that you use the green background with the star fabric for the star points, but light chain fabric in the corners. Here is the original center I made for the block above. 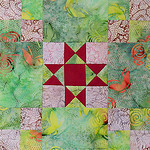 Although the fabrics, when sitting, uncut on my worktable seemed they would work … I found it nearly impossible to see the Ohio Star design in the sewn center and decided to use something else for my contrast fabric. The Ohio Star QST part starts with a 3 1/4″ square. 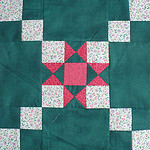 If you are a perfect piecer, this is great. 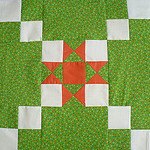 If you are a more casual piecer, you may want to use a 3 1/2″ square then trim the block to 2 1/2″. I made a sample and one set was perfect and one set was off and I have no idea why that happened but trimming the off block was a near thing. 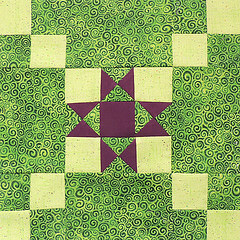 3 1/4″ will work just fine, but if you are at all uncertain of your piecing, try the 3 1/2″ of the green & high contrast fabrics. 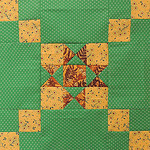 For more step-by-step information on making the quarter-square triangles (QST) in the blocks, here is a link to a blog post with good information and in-process photos. 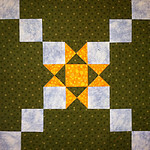 The author is making larger units–for our block, you’ll be starting with the 3 1/4-inch squares (3 1/2 if you like to cut larger and square-up and trim) for 2 1/2-inch quarter square units (to finish at 2 inches in the sewn block. Add the tag star chain to all your blog posts about this block. 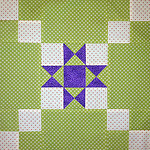 The category should be blocks when you are posting photos of your blocks to enter them in the drawing; use the category sent and received when you are posting about mailing or receiving blocks; and the category show and tell to share projects you make from this block (whether they are lotto blocks or blocks you make for yourself. 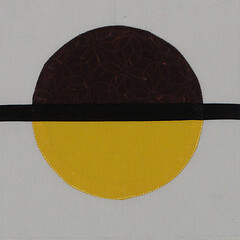 This quilt was made by Céline. 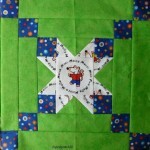 With her permission, I am sharing photos from her blog, Espritpatch. 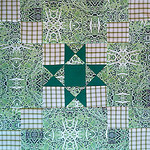 The quilt was part of the online Quilt Festival last fall–when I saw it, I zeroed in on the Star Irish Chain that she used with these great fussy cut Maisy fabrics. I thought it was the perfect design element to include and loved how it brought order to the collection of fussy cut blocks in various sizes. 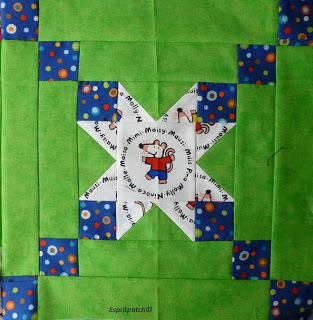 You can read about her quilt an see more photos here: Maisy is on the Bed. I designed our block with an Ohio Star in the center to make it easier to make in sizes that are a multiple of 7. 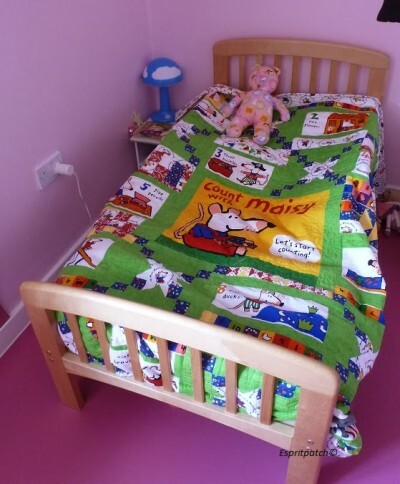 I look back at Céline’s quilt and can imagine an adult girly version where, instead of the Maisy fabric, some beautiful florals are cut into a variety of shapes and bordered in scrappy green fabrics and combined with our lotto blocks. Funnily enough, I didn’t remember her blocks had a green background when I chose it for us. These blocks were made by sneak peelers Andrew, Kathleen, Peggy, Julie P, Tracy … and me. You can see larger photos of all these Star Chain blocks in my Flickr photo set Star Chain Virtual Blocks. 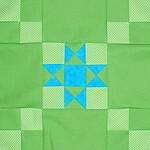 In the Mod-mod quilt, the Star Chain block is always combined with one of the Double Chevron blocks and three Bead-on-a-String blocks to form a module like this.